Meet beautiful Chloe! She is 2 years old, spayed female, 60 lbs, up to date shots and microchipped. We rescued Chloe from local high kill shelter. She came to the shelter as owner surrender because her previouos owner did not want to have her any more. She was very under weight when we found her at the shelter and had some skin infection. 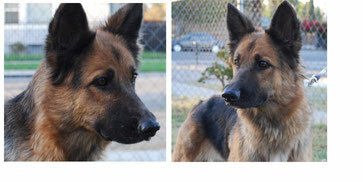 We gave her medical treatments immediately and she has turned to be a beautiful long hair German Shepherd! She loves people very much and good with other dogs and cats. If you are interested in Chloe, please fill out our "Adoption Application"